The forfeitures and striping of Sabino’s 2017-18 baseball title were upheld by the Arizona Interscholastic Association’s Executive Board, but the board reduced Sabino’s 2018-19 punishment to a warning. The ruling came during the board’s monthly meeting. Since it is off probation, Sabino, if it qualifies, can participate in this school year’s playoffs. An investigation initiated by the Tucson Unified School District revealed that Sabino’s baseball program broke the prior contact recruiting rule and that booster money was used to pay an assistant coach, TUSD Superintendent Gabriel Trujillo said Wednesday before his request to the board to allow Sabino to keep its title. Sabino’s head coach eventually resigned after the investigation and some assistant coaches were relieved of their duties. Sabino’s former head coach won’t be allowed to coach in the district, Trujillo added. As part of his district’s corrective action, Trujillo also ordered an audit of every single sports program in TUSD. Before the board’s unanimous vote on Sabino, David Hines, the AIA’s Executive Director, praised the thoroughness of TUSD’s investigation and corrective actions. Board President Herman House, the District Athletic Director for TUSD, recused himself from the Sabino discussion and vote. On Wednesday, the board also reduced American Leadership Academy Gilbert North’s two-year probation to one season for all of its sports. ALA Gilbert North is a new member of the AIA this year but violated the recruiting rule. The AIA along with state officials want to help educate students on the ill effects of opioid use. To do so, they have applied apply for a $100,000 grant, which will hopefully help develop a course similar to the AIA’s Brainbook, a comprehensive concussion education course that all student-athletes must complete, Hines said. Speaking of concussions, the AIA also is preparing to work with the Arizona Department of Health Services to develop a pilot program that will allow physical therapists to clear an athlete to play after a concussion. The initial plan is to have 4-5 physical therapists working with a physician. A physician with the Pinal County Health Department has offered to assist with the pilot program, Hines said. Currently, there are only two physical therapists (Phoenix Children’s Hospital employees) in the state who are allowed to clear concussed student athletes to play. During his monthly report to the board, Hines also gave the board an update on the AIA’s strategic and committee plan. Five committees comprised of state high school representatives will help set the AIA’s strategic plan for the next three years. The committees will start meeting before the end of the current semester. The Arizona Interscholastic Athletic Administrators Association completed its annual conference on Tuesday with 211 athletic directors attending, the second most ever to attend the conference. This was the third year that middle school athletic directors were included in conference, board member/AIAAAA representative Dr. Michael Fowler said. --Hines, Assistant Executive Director Joe Paddock, AIA Director of Finance Denise Doser and AIA Director of Business Development Brian Bolitho will be attending the Section 7-8 conference in Utah for the western most high school state associations. “It’s a great opportunity for us to see what it going on in other states and for us to promote our state,” Hines said. 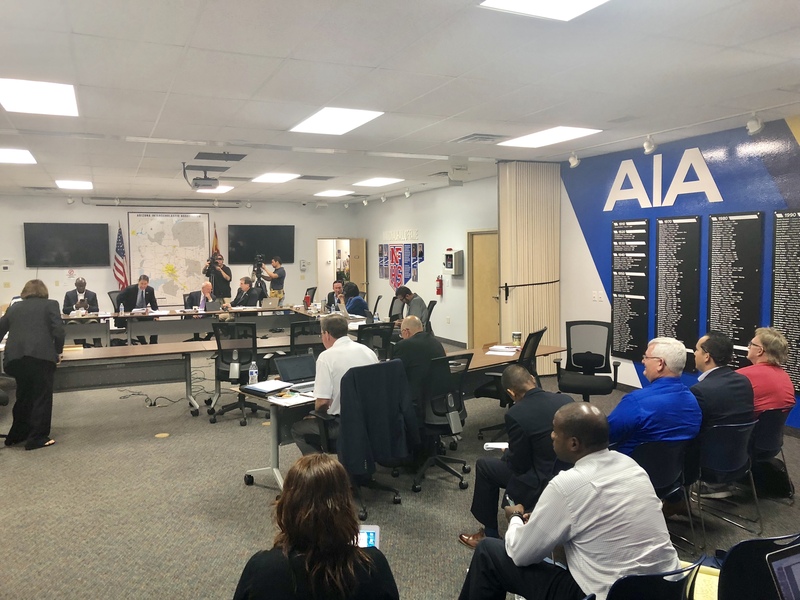 --Paddock informed the board that the AIA wants to organize a state wide conference for the student leadership group the AIA formed during the 2017-18 school year. Companies that might be interested in sponsoring the day-long event can contact the AIA. Paddock also mentioned that two workshops for new athletic directors have also been held, with good turnouts. The workshops help the athletic directors better understand the AIA’s bylaws. --The mandatory meeting for winter season coaches will be held Oct. 27 at Central High. Fiscal in-services are underway, and 46 new athletic directors have so far taken the AIA’s finance course, version 1.0, for ADs. Over 220 athletic directors have attended the required 2.0 fiscal in-service, said Doser during her report. Webinars for both courses are available. So far, 95 percent of the AIA’s schools have paid their membership dues and fees. The finance and officials departments of the AIA are appreciative that schools are up to date on RefPay, the system the AIA uses to electronically pay officials, Doser said. Every AIA member school is now using RefPay. Doser also expressed her concern about packages with AIA passes that were opened before they arrived at a couple of schools. --Thirty-three contest and or program cancellation requests. --The student eligibility appeal (paper review) and or requests for hardship eligibility (legal guardian) from Camelback, McClintock and Mountain Pointe. Washington High’s request for hardship eligibility under the age rule for a student athlete. --ALA Gilbert North’s request to exceed the participation rule by a semester for a student athlete. --The additional game requests by Payson and Flagstaff to help fill the schedules of two opponents. --A new policy for volleyball teams that tend to play double headers on Saturday to keep travelling costs down. For teams that play double header regular season matches, a varsity player can’t play more than 10 sets in one day. For freshman and junior varsity players participating in double headers, they can’t play more than six sets. --Marcos de Niza’s request to allow a foreign exchange student to play. --Northland Prep’s request to rescind the warning its soccer program since representative did atend the mandatory fall meeting for coaches. But the schools’ swim program’s warning will remain since one of its representatives didn’t attend the meeting. -- Three replacement requests for complimentary school passes. Empire’s request to return to the 3A Conference after the current two-year scheduling block ends was tabled until next month’s board’s meeting. Empire moved up to the 5A Conference this year, because students from nearby schools without sports programs, Vail Academy High and Andrada Polytechnic, were allowed to compete for Empire. But Empire representatives said that those students will no longer suit up for Empire after the 2019-2020 school year. The board would like to gather more information before making a decision. --Agua Fria District’s request to exceed the permissible swim meet rule so it can host a district meet was denied. --The last days to play/practice on the Division II and D-I state golf courses are Oct. 20 and Oct. 27, respectively. 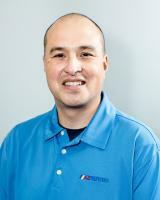 --The board recognized board members Toni Corona, the 3A Conference rep, and House during the Wednesday’s meeting. During the AIAAA conference, Corona earned 3A Athletic Director of the Year honors, and House was inducted into the AIAAA Hall of Fame. Advisement for girls volleyball program of Sunnyside. A student with a 550 transfer paperwork on file was supposed to sit out the first half of the season but participated in a match. Advisement for activities program of Willow Canyon. A football player who transferred multiple times was ineligible for one year but played in a game. In the school’s report, the school’s athletic director said he failed to follow-up on the student’s enrollment status. Willow Canyon’s request to rescind the forfeiture of the game the student played in was accepted. Advisement for activities program of Central. A student participated in a 7 on 7 tournament and in summer workouts while still enrolled at Tempe High. Advisement for Globe’s football program. A representative from the program failed to attend the fall football coaches meeting. Warning for cross country and spiritline programs for Mingus. Representatives from each program failed to attend the AIA’s mandatory preseason meetings. Warning for Flagstaff’s football program. A JV coach allowed a student to practice without properly being cleared by the school’s athletic office. Gila Ridge’s violation report was accepted. The head coach allowed a non-approved coach to help out a couple of times during the summer. Warning to Gila Ridge’s spiritline program. A senior practiced without being cleared by the school’s athletic office. Advisement for Lee Williams’ spiritline program. The team held tryouts a week before it was supposed to.